Lee De Forest (1873–1961) was a remarkable American inventor with over 180 patents to his credit. He took credit for the Audion, first vacuum triode, a vacuum tube that takes relatively weak electrical signals and amplifies them. De Forest is one of the fathers of the electronic age, as his Audion helped to usher in the widespread use of electronics. He is also credited with one of the principal inventions which brought sound to motion pictures. A son of a minister, born in Council Bluffs, Iowa, and Ph.D. in electrical engineering from of Yale University (1899), Lee De Forest was a rather controversial person—he was involved in several patent lawsuits and spent a substantial part of his income from his inventions on the legal bills. He had four marriages and several failed companies, he was defrauded by business partners (and defrauded business partners himself), and he was once indicted for mail fraud, but was later discharged. The Audion (also called the De Forest valve, and since 1919 known as the triode) was a result of De Forest's interests in wireless telegraphy. It was invented in 1905, and in January 1906, De Forest filed a patent for diode vacuum tube detector. The Audion actually was a bulb with the same contents as the Fleming diode, except for an added electrode, but De Forest always claimed, that he didn't know about the Fleming diode. De Forest was granted a patent for his early two-electrode version of the Audion on November 13, 1906 (see US Patent 841386), but the triode (three electrode) version was patented in 1908 (US Patent 879532). It was the forerunner of the triode, in which the current from the filament to the plate was controlled by a third element, the grid. A small amount of power applied to the grid could control a larger current from the filament to the plate, allowing the Audion to both detect radio signals (that is, make them audible) and to provide amplification. However, De Forest's Audion is quite distinct from the true vacuum triode in that it is not capable of linear amplification, not to say for the semiconductor transistor, which is a base element of every electronic computer. 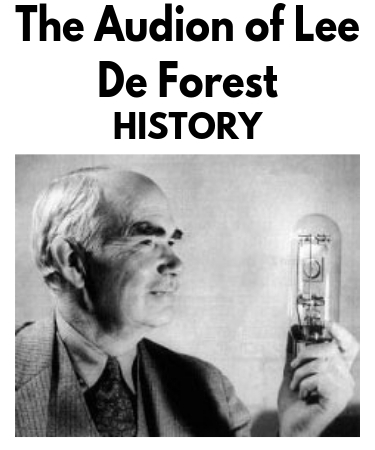 Lee de Forest considered his triode simply as a more sensitive type of diode detector. 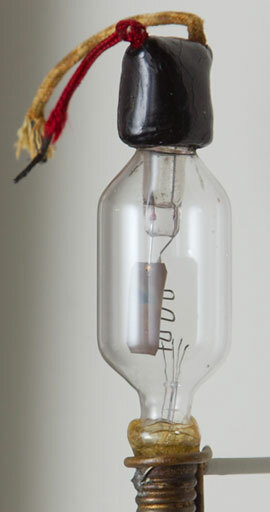 In 1911 Edwin Armstrong was the first to recognize that the triode could operate as an amplifier. In Forest's original design, a small metal plate was sealed into the lamp housing, and this was connected to the positive terminal of a 22 volt battery via a pair of headphones, the negative terminal being connected to one side of the lamp filament. When wireless signals were applied to the wire wrapped around the outside of the glass, they caused disturbances in the current which produced sounds in the headphones. This was a significant development as existing commercial wireless systems were heavily protected by patents and a new type of detector would allow De Forest to market his own system. He eventually discovered that connecting the antenna circuit to a third electrode placed directly in the current path greatly improved the sensitivity. In his earliest versions, this was simply a piece of wire bent into the shape of a grid-iron (hence "grid"). Compared to all competing devices at the time, the Audion was unique in that it did not draw significant power from antenna/tuned circuit, which allowed the tuning circuitry to operate with maximum selectivity. With virtually all other systems, all of the power to operate the headphones had to come from the antenna circuit itself, which tended to "damp" the tuned circuits, limiting their ability to separate stations.